Prior to the 18th National Congress of the Communist Youth League, CAAC Deputy Administrator Dong Zhiyi met in Beijing with the delegates to the National Congress from the civil aviation industry, and presented them with the book - Seven Years of Xi Jinping as an Educated Youth. Dong encouraged young civil aviation delegates to embrace the new era, strive to be new youth, take up the new mission with new efforts, and bring together the vitality of youth that can push forward high-quality development of civil aviation. On behalf of CAAC, Dong Zhiyi congratulated the delegates on being selected to attend the 18th National Congress of the Communist Youth League. He said that the 18th National Congress is an important meeting to be held in the new era of socialism with Chinese characteristics and a political event with major significance for young people from all ethnic groups of China. Representing the youth league members from the civil aviation industry, the delegates must conscientiously fulfill their duties as delegates, hash out ideas and suggestions, speak for the civil aviation community, tell the stories in the civil aviation industry, and fully demonstrate the demeanor of youth league members in the new era and the positive image of the civil aviation community. During the meeting, Dong Zhiyi and the delegates shared their experience working in the Communist Youth League and had a heated discussion. 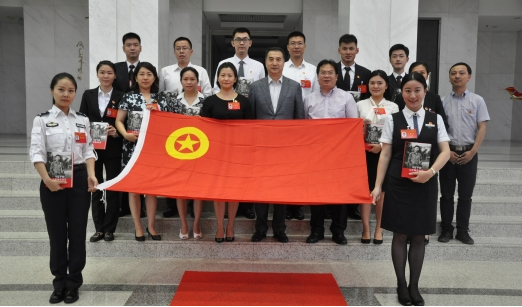 The delegates expressed their great honor to be selected to participate in the 18th National Congress of Communist Youth League. They will fulfill their duties with enthusiasm and high morale, speak for civil aviation youth and convey the guiding principles of the 18th National Congress of the Communist Youth League to the youth league members in the industry. Young members of the league will fulfill the mission and be worthy of role models of youth. They will prioritize theoretic learning, and work hard to spur development. They will contribute their efforts to the great course of building a strong civil aviation powerhouse, and write a splendid youth chapter for the realization of the Chinese dream of the great rejuvenation of the Chinese nation.